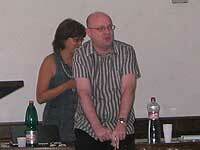 Everything came together in Prague in July 2006. It was the venue for the annual conference for PME and Warwick Mathematics Education Research Centre had a long-term partnership with the Mathematics Education Group at Charles University, Prague. 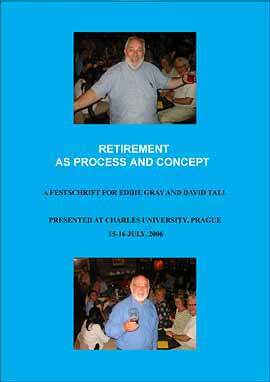 So when David Tall and Eddie Gray retired from Warwick, it was natural that the retirement party should be shared in Prague with all our friends. Adrian Simpson (now Principal of Butler College, Durham) and Nada Stehlikova organised the conference supported by her colleagues from Charles University. John Monaghan organised a surprise party where anyone at PME was welcome to our farewell. Select from the links above to see photographs of the conference, the party or other photos or download the Festschrift (29 papers, 298 pages, 3mb download) presented to David and Eddie to celebrate their lives in Mathematics Education Research. 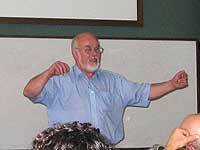 Go on, take the course  I’m told it’s great fun and it’s run by this complete bearded loony. My first introduction to David Tall was a problem-solving course I took as an undergraduate at Warwick University in the late ’80s. I had become rather disillusioned with the standard definition-theorem-proof courses which (once I had had a drunken epiphany which led me to understand this ‘proof’ thing that the lecturers kept referring to) I was passing with consummate ease and very little understanding. A friend recommended this course to me and, to a great extent it was the bearded loony (along with Thinking Mathematically, the book of another of the bearded loonies of mathematics education who I was to meet later) who reignited my enthusiasm for mathematics. Eddie, on the other hand, appeared more slowly as an influence and an immense force of kindness and support when I returned to Warwick some 10 years later as a lecturer in the Mathematics Education Research Centre. Given my own research interests, I had initially little connection with his work but became increasingly intrigued with first his papers with Demetra Pitta and later his work with David on the notion of procept. The former drew me in to some the psychological literature they had based their work on, encouraging me to read beyond the mathematics education literature into the often more developed and robust world of cognitive psychology. The latter influenced my thinking both as a theory and as a model of theory development. The intellectual work of both Eddie and David, which has had such a profound influence on my thinking and on that of so many others, pales beside the roles they have played as mentors. More than any others in mathematics education, they have grown a family around them  their students are their academic sons and daughters and they dote on their academic grandchildren with almost as much glowing, grandfatherly pride as they dote on the astonishing number of their biological grandchildren. In this book, you will find but a small sample of the influence they have had, and of the love and respect in which they are held. The quality of the papers and the range of topics they cover testify to their prolific generation of ideas which, in varying from counting to topology, can be said to be cover mathematics from cradle to grave. On a personal note, there is little doubt that I would never have achieved the position that I am in without them. David’s support for my thinking and positively critical challenging of my ideas are at least matched by Eddie’s support for my intellectual and personal development and unstinting friendship. While there may be occasional hints of (justifiable) pride, no-one would dare accuse David or Eddie of cowardice or laziness, and  intellectually  both have as loud a bark as one would wish. While we wish both of you and your families well, the world will be sorry that you retire.